Sandi Smith flies to the exotic location of Lahaina, Hawaii, to interview an old woman who lived through the many changes in the islands. Her personal life on hold because her husband is Missing In Action in Vietnam, she seeks to be closer in case he's on a list of prisoners soon to be freed. 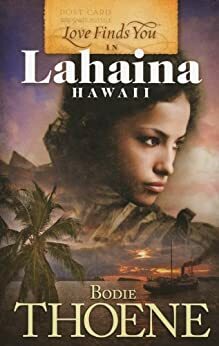 She becomes engrossed in the story of Victoria Kaiulani Cleghorn, Crown Princess of Hawaii and the next royal heir to the throne. The tale of intrigue and betrayal helps keep her mind occupied as her own life seems to remain in limbo. I borrowed this book from a friend. It's an old title, but I've always wanted to read something by Bodie Thoene. Wow! I was impressed with the way the author described the settings. Woven seamlessly throughout the story, they could easily have been another character. I could see, smell, and hear the Hawaiian Islands and England. The characters were as diverse as the settings. From ancient Auntie Hannah in the present day portion to the young princess, who desired the wisdom of Solomon to rule her people well, they each showed a level of growth and maturity. I've heard rave reviews about this author, and I can see why she's a favorite of readers. Five stars for this book. Disclaimer: Neither the author nor the publisher paid for a review. All opinions are mine and mine alone, as always. Writers: Crafting a great setting is a tough skill to master. Do you find it helpful to read books that get it right? Please share your experience. Readers: How important is a novel's setting to your overall reading experience? Please share.